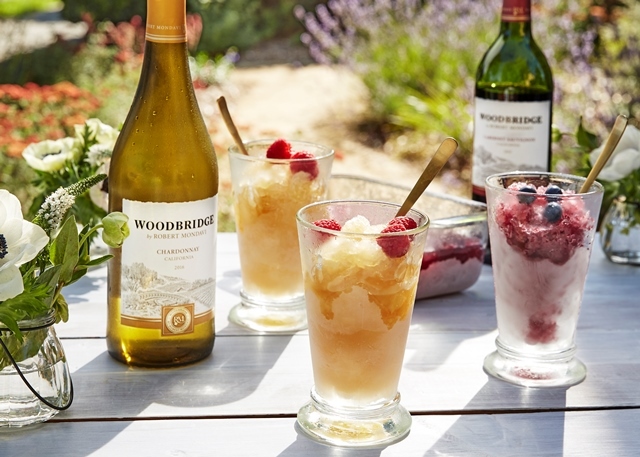 With Easter entertaining just around the corner, impress guests with these cooling red or white wine granita recipes, courtesy of Woodbridge by Robert Mondavi. 1. Make the granita: In a 9 x 13-inch pan, whisk together the honey and hot water until combined. Whisk in the Woodbridge by Robert Mondavi Cabernet Sauvignon. Place the pan on a baking sheet (to prevent freezer spillage) and place squarely in the freezer. Freeze for at least 4-6 hours (or up to 2 days) before “flaking” with the fork to create slushy granita. 2. Serve the granita: Serve in paper cups, cones or small glasses. This is also great sprinkled over vanilla ice cream or whipped cream. 1. Make the granita: In a 9 x 13-inch pan, whisk together the honey and hot water until combined. Whisk in the Woodbridge by Robert Mondavi Chardonnay. Place the pan on a baking sheet (to prevent freezer spillage) and place squarely in the freezer. Freeze for at least 4-6 hours (or up to 2 days) before “flaking” with the fork to create slushy granita.